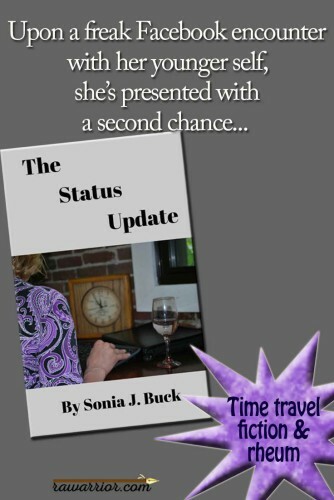 I read The Status Update by Sonia J. Buck on my iPad recently. Did you know you could read a Kindle book on just about any device? You can bookmark, highlight, and make notes. And I did. Most of my notes on The Status Update concern portions where I noticed insider knowledge about rheumatoid disease (RD). For example, only someone living with RD would know how much people living with RD hide their illness from others (Chapter 6). I could even recognize Christine, the main character, blaming herself for problems related to her illness, a typical RD pattern. I absolutely recommend this short story even if I might have wished some details were different. It held my attention for several days after I finished as it invited me to think about what paths I might take in my own life. Over the years I’ve met Sonia, a Maine attorney, on Twitter in our #rheum community and I’ve been aware that she lives with rheumatoid disease as well. I asked her to comment on some of the twists and turns of the book. She told me it “is supposed to be a bit mysterious.” She explained that she employed the butterfly effect, a necessity in time travel genre. Should you read The Status Update? If you love Facebook this book is for you. That’s right – Facebook plays a big part in The Status Update. If you like the Sandra Bullock movie, The Lake House, you’ll enjoy The Status Update. I always loved the 2000 movie Frequency with Dennis Quaid and Jim (The Passion of the Christ) Caviezel. It’s intense, but the desperate attempts for good to conquer evil held me. So if you enjoy Chaos Theory or the butterfly effect, you’ll enjoy The Status Update. Thank you, Sonia, for this step in the right direction. Still grieving decade old losses and feeling the weight of new losses, Christine felt like everything was slipping away from her – her home, her physical health, her family. 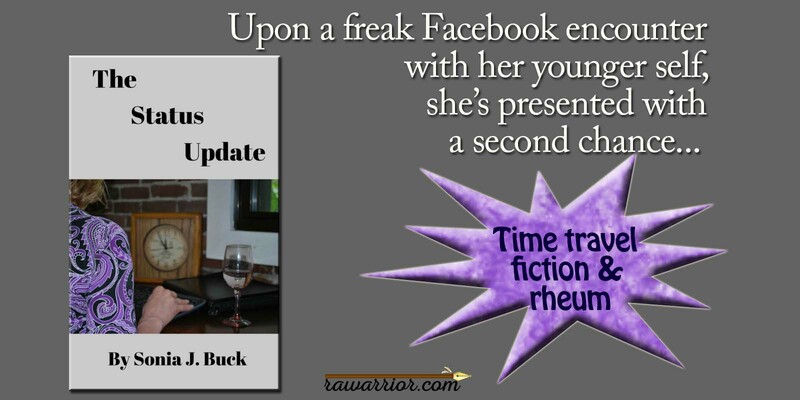 Upon a freak Facebook encounter with her younger self, she’s presented with a second chance. Has Christine finally lost her mind? Or has she been gifted with a rare opportunity to change the course of her life? And if this gift is real, can Christine convince her younger self to believe her and to heed her warnings? What about the butterfly effect? Will Christine’s modifications result in some universal impact? Should she try to stop tragedy for all involved or should she be more careful, and instead just focus on protecting her family? I love reading on my Kindle, it’s so easy to hold or if my hands are bothering me, I fold the case like a tent and it stands up by itself. I love reading stories about people with RA. They are hard to find. I read the Secret Life of CeeCee Wilkes which touches on RA as well. The author, Diane Chamberlain, has RA too and is an exceedingly nice and genuine lady. I met her when we both ended up getting Remicade infusions at the same time and I have been a big fan since. I love all her books I’ve read and though only CeeCee deals with RA she does bring to light the emotional and physical impact the disease has on the patient and their families. Anyway I could go on about Diane’s books and I’ve reviewed the one I read on my blog too. Reading gives me that escape from reality I sometimes I need and is My comfort when I am in too much pain to do anything else. Thanks for sharing this short story, I would love one day to write a book myself. As much as I love to read, I an starting to love writing too. Hi Tanya, thanks, I will check out Diane Chamberlain’s book too. Keep up the writing and your book will happen. I write for a few minutes every day even if my hands hurt 🙂 Take care! Congrats, Sonia. I’m so proud of you!